The Midwest Guinea Habitat is a perfect space for hedgehogs. This cage comes with a detachable top which allows the owner to get a clear view of what the pets are up to and also allow ease of access. 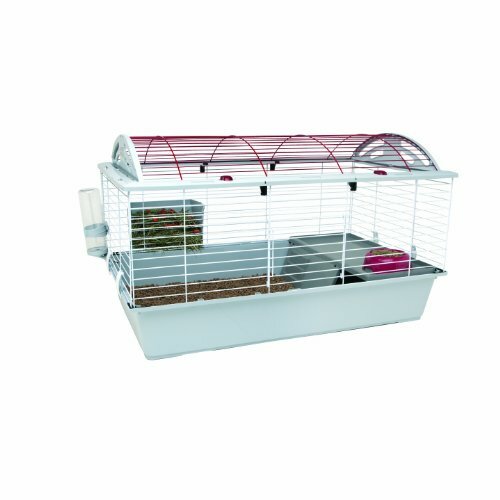 Pet owners in need of a spacious and durable pet home will find this cage great. The habitat has been designed considering the needs of the pet and the user. To this end, the pet has 8 square feet of room for play and exercise while the owner enjoys the ease of assembly, storage, and cleaning. Veterinarians recommend that hedgehogs have enough area for play and for exercise. This cage comes with eight sq feet of living area enough for pets to explore. Better yet, the Plus version of the cage is expandable making it ideal for any number of hedgehogs. The top of this cage comes with a divider panel that divides the cage into care and plays areas. This top can be removed to increase access to the cage and can be replaced to protect the pets from predators. The top is foldable making it easy to store when not in use. The divider comes with hinged lock-in-place doors. The bottom of Midwest Guinea Habitat is not wired but instead comes with a PVC lined canvas which makes it easy to clean, easy to remove and is leak-proof. The canvas makes it easy for the pet owner to easily take care and maintain the cage while it provides a sturdy ground for the pets. Canvas protects the sensitive feet of guinea pigs. Midwest Guinea Habitat is 14 inches high. This provides enough room for the hedgehogs, makes it secure and accessible and makes the cage suitable for indoor and outdoor use. Pet owners will not need any tools to assemble the cage; a few minutes and the cage is up and running. A cage with an area of 8 sq. feet would take up a lot of space in the store. However, when not in use, the cage folds flat, making it easy to store. This is economical in terms of space. Midwest Guinea Habitat has a lot of advantages both for the pets and for the owners. Cage comes with enough living area for the pets to play and exercise. Meets all the standards set by veterinarians and breeders. Though the cage has a rating of 4.5 out of 5 on Amazon after 2377 reviews, it has one major drawback. The canvas bottom is not hard enough, and pets like to chew through it thus creating holes at the bottom of the cage. Midwest Guinea Habitat measures 47 inches by 24 inches by 14 inches and weighs about 12.5 pounds. The space is enough to accommodate three large-sized hedgehogs, but it is recommended that you only have two hedgehogs per habitat. The wire used to construct the cage is high quality making it durable and safe for your pets. The wire is epoxy coated. It comes with a one year Manufacturer’s Warranty on the purchase and has been designed to be portable and eco-friendly. The cage is easily taken apart while cleaning. If you are looking for a spacious and a cost effective cage for your guinea pigs, Midwest Guinea Habitat fits the description. The cage has had thousands of purchases and thousands of positive reviews. It is ideal for hedgehog pet lovers. The cage measures 47 inches by 24 inches by 14 inches and weighs about 12.5 pounds. The Midwest Guinea Habitat is a perfect space for hedgehogs. This cage comes with a detachable top which allows the owner to get a clear view of what the pets are up to and also allow ease of access.